I’ll be honest: the first time I visited Anacortes, I was totally stereotypical. I rolled into town, grabbed a bite to eat, and took a look around. Within a few hours was on a ferry to the San Juan Islands. This is what most people do. 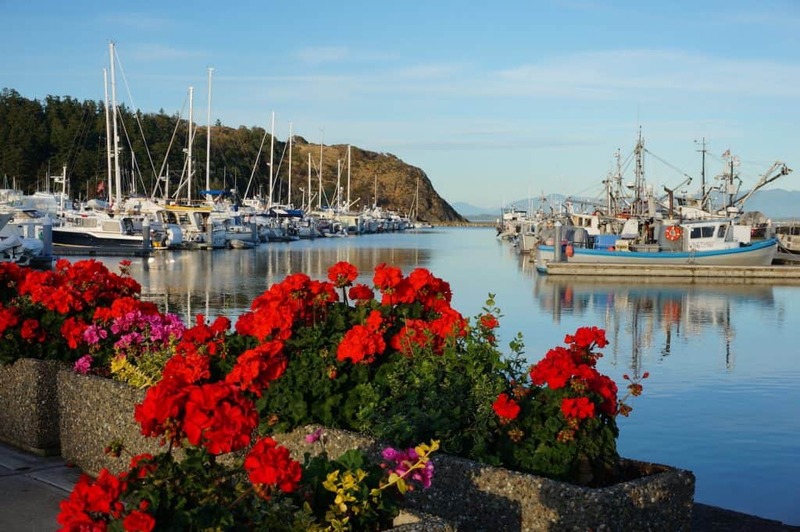 They use the town of Anacortes on Fidalgo Island as a stopping off point to refuel before heading over to Lopez, Shaw, Orcas, or San Juan Islands. Because the San Juan Islands offer the ‘real’ beauty and the ‘real’ adventure that draws visitors to the region. Now, I know better. I recently had the opportunity to visit Anacortes several times, and to immerse myself in the city and surrounding region. 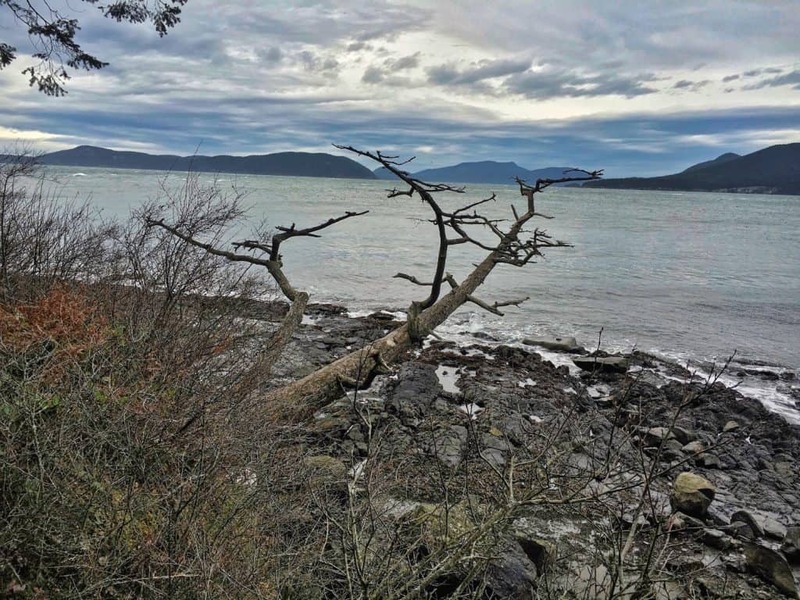 While a few days is by no means enough to discover and unlock all the secret treasures of Fidalgo Island, I was surprised by how many gems were hidden just under the surface – just out of sight from what you see on your way to or from the ferry terminal. If you’re visiting Seattle (or live there) and want to travel to Anacortes, you need a car. It’s a 90-minute drive to Anacortes, north on Interstate 5 and west on Washington Highway 20. On Friday afternoons, you might encounter some traffic leaving Seattle through Everett or Maryville. This can add up to an extra hour to your drive. Before you hop in the car and go, here are a couple quick tips to help make sure you have a great trip. You might think Anacortes has the same weather as Seattle because they’re so close, right? Actually, Anacortes, like the neighboring San Juan Islands, is in the rain shadow of the Olympic Mountains. This means Anacortes actually has pleasant, mostly rain-free weather. It only rains an average of 26 inches per year in Anacortes. It never hurts to throw a light rain shell in your bag though, in case you’re in town on one of those rare, rainy days! In addition to a rain shell, this itinerary requires a few other packing tips. While Anacortes experiences temperate winter weather and warm summers, the mornings can be chilly. I love my UNIQLO ultra light down jacket for trips like this in the Pacific Northwest, because it packs small and light but cuts the chill on cool mornings and evenings. If you decide to go hiking, be sure to pack sturdy walking or hiking shoes. I love Soloman trail running shoes because they’re pretty much good for anything adventurous. You’re in a sunny part of the Pacific Northwest… don’t forget to pack sunglasses! If you choose to go kayaking or whale watching, you might want to grab a waterproof case for your phone. I use the Optrix by Body Glove on my most adventurous days. Now you’re all set for what to bring and how to get here. 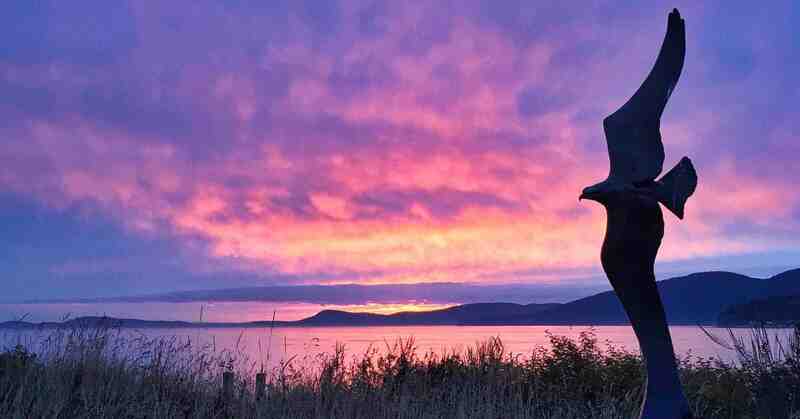 Let’s cover what to do in Anacortes so you can start planning your itinerary. This is an element that Anacortes obviously wants to visitors to experience. You can pick up a free map brochure which details the walking tour through historic black and white photos. With that in one hand, you can visit up to 30 historic buildings dating back to the origins of Anacortes in the late 19th century. 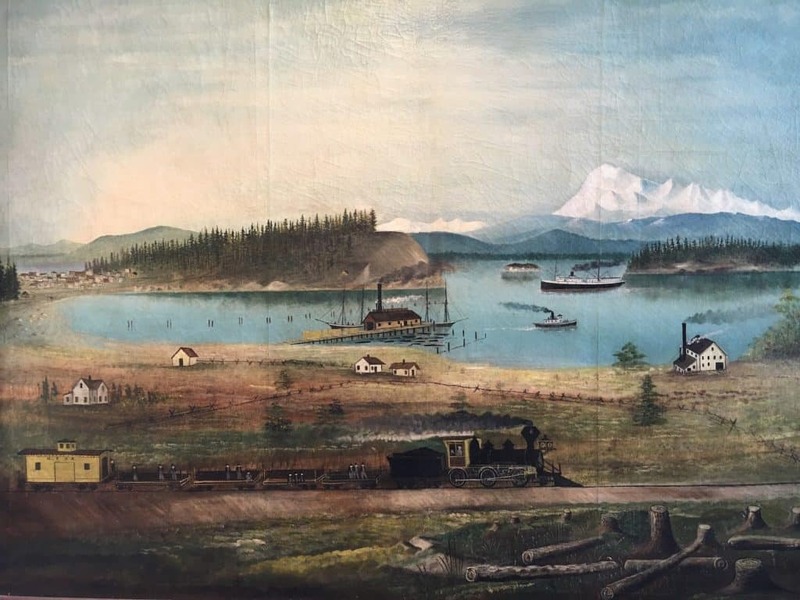 There are also historic figures painted and hung around town, which help you learn more about the people and characters who impacted Anacortes’ history and called this town home. The W.T. Preston is one of the most unique historic features in Anacortes. This permanently dry-berthed ship is one of only two remaining snagboats who helped keep Puget Sound clear for other boats by removing logs, stumps, and other debris for over 50 years. During her time, she worked the thousand square miles of waterways and helped keep the other ships sailing along smoothly. Restored, the ship is now a museum, and in addition to learning the history of shipping in the Puget Sound, you can explore the many decks, cabins, and features of the ship itself. The Maritime Center next door has additional information about maritime history in the Puget Sound and Anacortes specifically. Cap Sante is the name of rocky point that juts out into Fidalgo Bay, east of Anacortes. The feature creates a natural harbor and the Cap Sante Marina sits in its shadow. Most of the hillside has been developed into residential properties, but a small park, Cap Sante Park, has been left for visitors and locals to enjoy. You can access Cap Sante from the small parking lot at the top (and a second parking lot further down the hill). 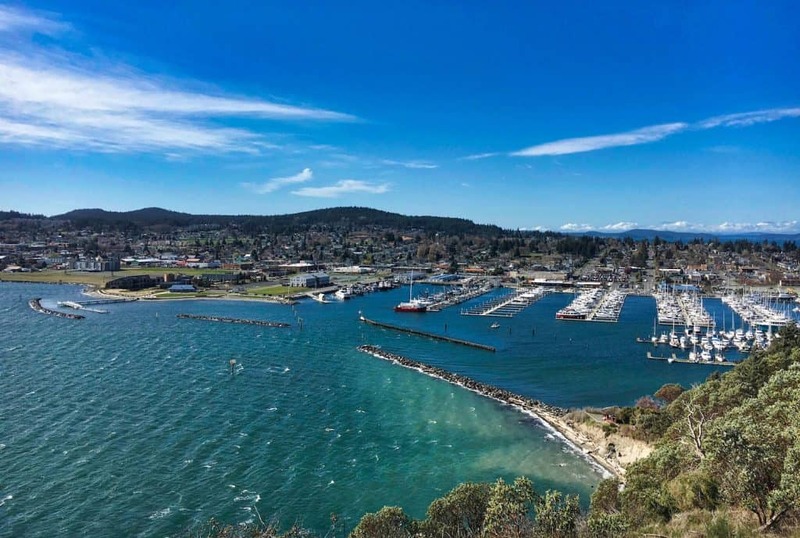 Cap Sante Park also affords stunning views of Anacortes itself; while trees obscure the northern part of the city, you can see most of the marina and residential areas to the south. Looking east, you can also see the glittering Shell refinery on Mach’s Point, several small islands, and the stunning northern Cascade mountain range, jagged peaks pushed up from where the North American and Pacific tectonic plates meet. As pictured above Cap Sante is open day and night. You can catch the sunrise here, get a picturesque view midday, or stargaze at night. 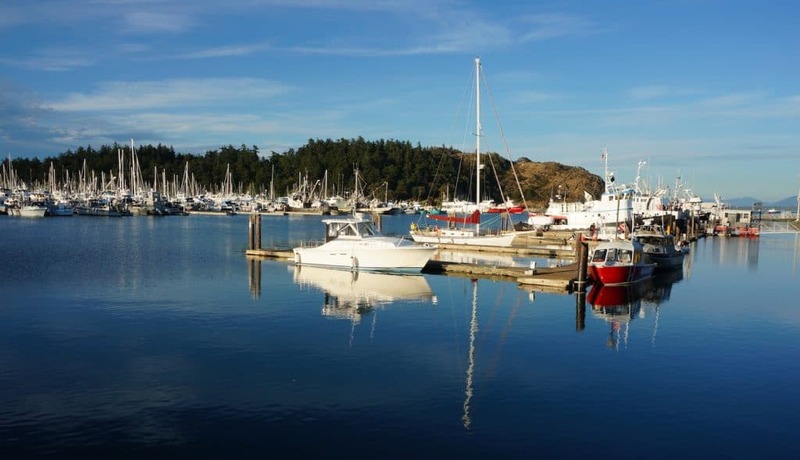 On the westernmost point of Fidalgo Island, you’ll find Washington Park. The 220-acre park began after an eight-acre bequest made by German immigrant Tonjes Havekost inspired the city to preserve the surrounding region. And what a region it is. Laced with short hiking trails and looped by a 2.2-mile road that allows us “non-outdoorsy” people to still enjoy the space, Washington Park is a geologist’s dream come true. The majority of the land sits on serpentinite, a type of rock that was formerly part of the earth’s crust, now pushed upward through the dynamic tectonic action common to the region, and widely exposed in some parts of the park. There are also glacial tubes and erratics (rocks left behind by glaciers long receded) throughout the park begging to be discovered. 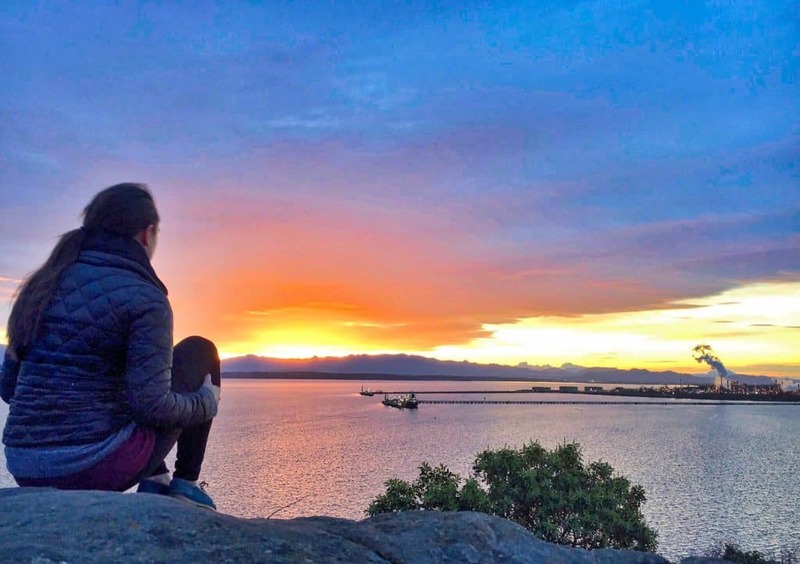 Additionally, you can picnic on Green Point where daffodils dotted the verdant land and the view allows you to see the comings and goings of ferries and shipping containers on Rosario Strait. You can explore a classic rocky Washington beach at West beach. You can also hike out onto Burrow’s Overlook to see the serpentinite exposed and great views to the south including Burrow’s Island. Also on Burrow’s Overlook, Tonjes Havekost’s grave and monument stands sentry, a monolith of granite. 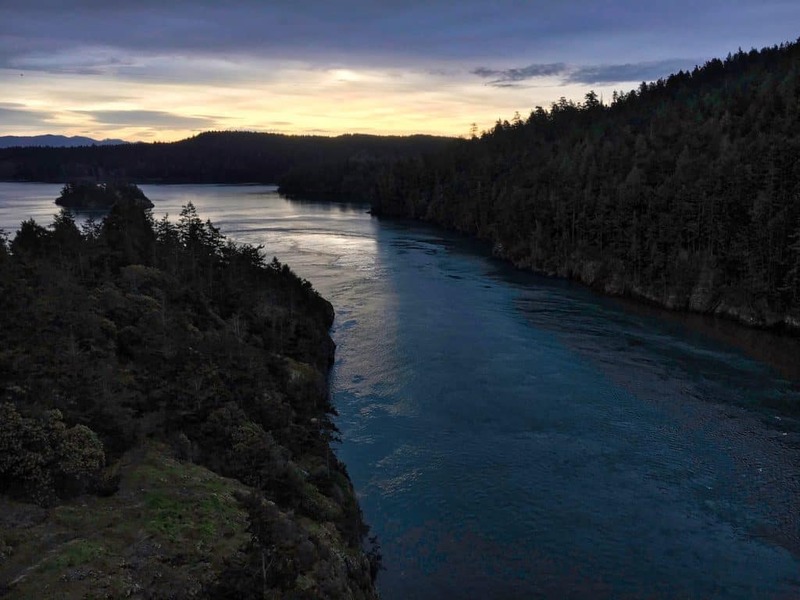 Deception Pass draws visitors from around the state, and many come to explore the State Park without seeing the rest of Fidalgo Island at all (hence my putting it last so you’d have to see there are other beautiful reasons that outdoor-lovers will want to spend time there!). 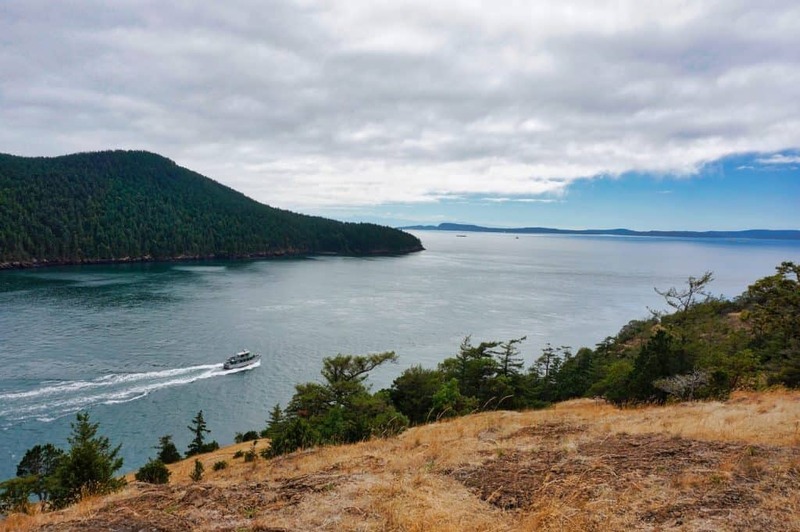 Connecting Fidalgo Island to its southern neighbor Whidbey Island by way of tiny Pass Island in the middle, Deception Pass is so named because Captain George Vancouver thought Whidbey was actually a peninsula until further exploration of the area proved him wrong. For the 11 years prior to completing the current bridge in 1935, the pass was crossed by way of a ferry operated by a hearty, tiny woman named Berte Olson (why is there always a hearty, tiny woman in all the good history stories? Coincidence – I think not!). 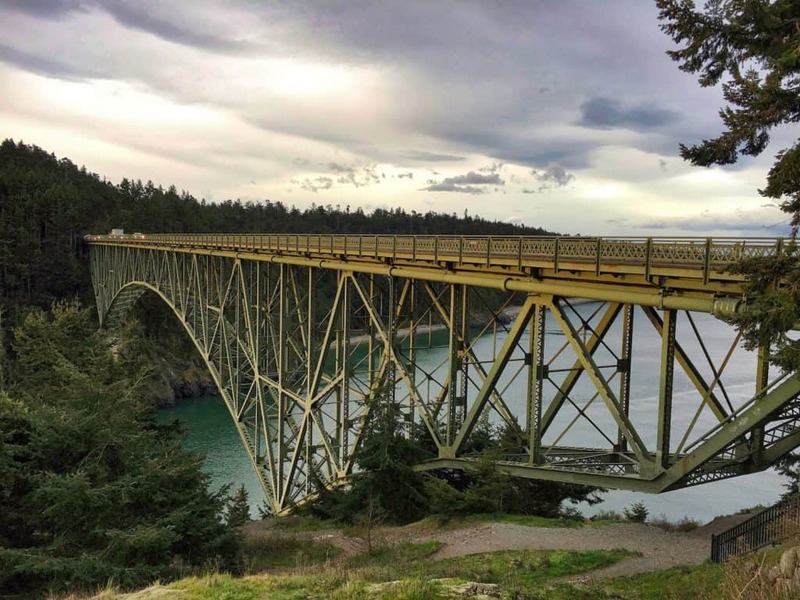 Now, the 1,487-foot long bridge is a small part of what draws visitors to the area, and a thrilling experience to stand on, with a 177-foot drop below you into Deception Pass itself. Right in the middle, you can feel the weight shift as cars pass from one half of the bridge to the other. 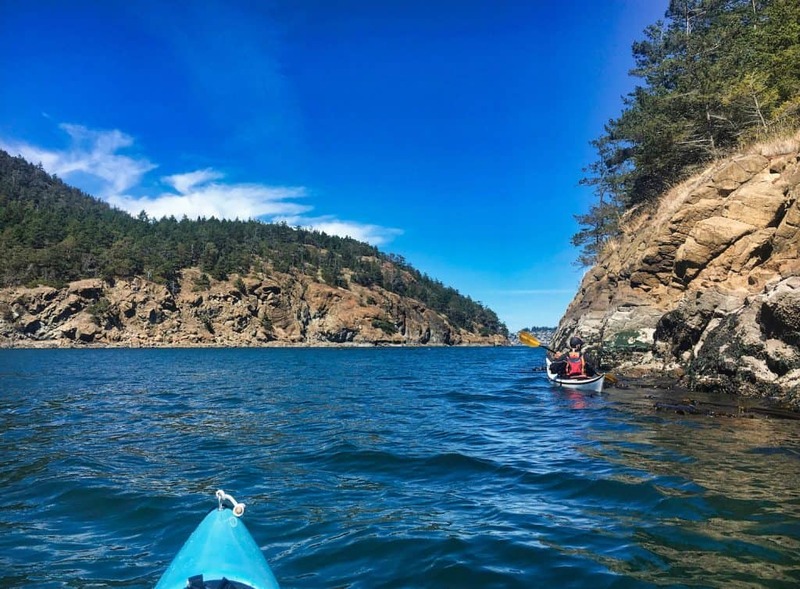 Deception Pass State Park boasts nearly 21 miles of freshwater and saltwater shoreline and 38 miles of hiking trails, making it an irresistible stop for those looking to hike in the region. There are also boat tours through the Pass in the warm weather months. I’m not a huge kayaker, but I seem to go kayaking a lot when I travel! (It’s a really good ‘light adventure’ experience.) 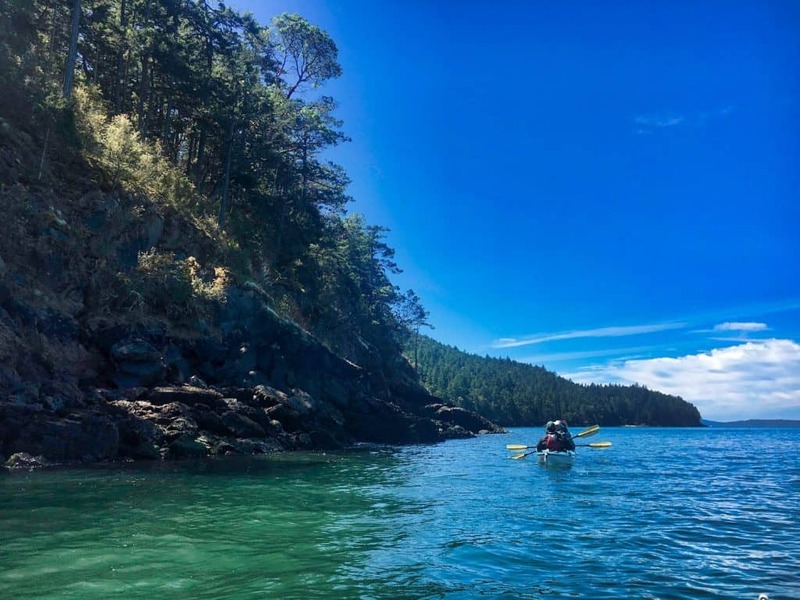 On my most recent trip to Anacortes, I went out for a paddle around Burrows Island with Anacortes Kayak Tours. It took about 90 minutes for the tour and was actually pleasantly challenging – I also got a bit seasick though from rougher seas on the far side of the island. ? While kayaking, you’ll have a chance to see marine life like sea stars, crabs, seals, and otters, and maybe even whales on a lucky day. Anacortes is a small but lively community. On my most recent trip, I had the chance to attend a few community events. These are usually held at local parks, such as Washington Park (there’s a nice picnic area and beach on the north part of the park near the entrance) and the beautifully designed Seafarers Memorial Park near Cap Sante Marina. Events are offered year round (and listed on the Anacortes website). Depending on when you visit, they could be a cool add onto the rest of your itinerary too. A three-day trip is a great opportunity to sample what a city has to offer. In Anacortes, there are three main themes: History, Outdoors, and Culinary. I’ve mixed these together a bit while still trying to give you a sample of all three. Today’s a great day to visit the W.T. 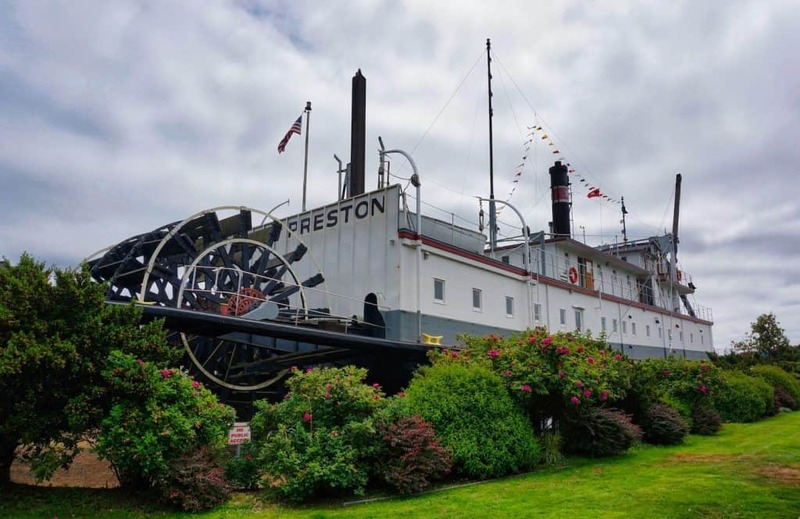 Preston and Maritime Center to learn about Anacortes’ maritime history. If there are any community events at Seafarers Memorial Park, this is also a good night to attend them (especially if you arrive on a Friday!). In 1879, Amos Bowman founded Anacortes and named it after his wife, Anne Curtis. As a railroad surveyor, Bowman had big dreams that Anacortes could be the New York of the West Coast. When the transcontinental train route terminated in Tacoma rather than Anacortes, a bust followed and the train line stopped running shortly thereafter. The depot still stands near the marina, now an arts and community center, and the former rail yard plays host to the weekend market and entrepreneurial food trucks instead of steam engines. Built originally at the corner of 8th Street and I Avenue in 1891, the McNaught Building (pictured above) was moved to its current location at 5th Street and Commercial Avenue during its time as the Anacortes Mercantile Company. By 2007, it became the Majestic Inn & Spa and they have added a beautiful second building on the block complement the demand for luxurious accommodation in the city. 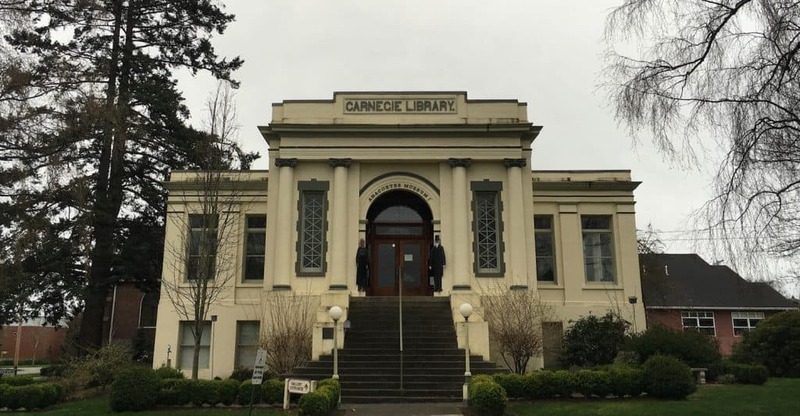 In 1908, a community grant sought to open a library in town, and a $10,000 grant was requested from the Carnegie Foundation. The only terms of the grant were that the town agreed to fund $1,000, and another $1,000 per year to cover maintenance and library costs. By 1910, the library was built and open to the public. Now, it houses the Anacortes History Museum, which is free and open to the public most days. What draws most travelers to Anacortes is access to the great outdoors. As you’ve already read, there are some great outdoor activities to enjoy. Here’s how I’d spend a day exploring the outdoors near Anacortes. I would start in the morning with kayaking on Burrows Bay. The water will likely be calmer in the morning than afternoon, which is good for folks like me who get queasy. Kayaking is a good way to get your heart pumping and get your morning workout in. Star the morning by boarding a whale watching boat! As part of the San Juan Islands, Fidalgo Island is surrounded by waterways that whales are frequently seen in – including the resident orcas of the San Juans. In certain months, you might also see gray whales on their migration. Otherwise, look for Orcas, humpback whales, and minke whales on a 3-4 hour tour. If you’re not tired of boats, you could also book a boat tour of Deception Pass. There are also sunset cruises you could do at the end of the day. If you’d rather be on land, head to Deception Pass for hiking and tidepooling at the beaches. At the end of this day, you can head back to Seattle or wherever your travels take you. I haven’t mentioned meals at all, because there are lots of great restaurants in Anacortes – and you’ll need to choose which ones you want to enjoy while visiting. Or you could squeeze them all in like I usually do and end up needing a few light meals when you return home! The two main restaurants for breakfast in Anacortes that I recommend are Dad’s Diner and GERE-a-DELI. Dad’s Diner is known for homestyle comfort diner food. Think biscuits and gravy (which I’ve ordered both times I have visited), fried eggs, thick-cut bacon, country-style potatoes. Oh, and fresh, local coffee. GERE-a-DELI is a local deli, housed in an old auto garage which still retains the motif. They’re known for their bagel sandwiches, pictured. There are other cafes and delis throughout town. If you just need coffee, Acme Coffee made the best cold brew I’ve had in my life – I’m confident their hot brews are also delicious. Anacortes has a bustling dining scene for a town of 17,000, and there are plenty of restaurants I’ve never visited despite repeated trips. If you don’t see or read about something you love that I recommend, there’s plenty more to choose from on the Anacortes website. I dined at Union Tavern on my most recent trip, and was totally impressed. This hip little restaurant had some fantastic drink options and a foodie-focused menu. Yes, we had oyster shooters, fancy hot dogs, and wine! 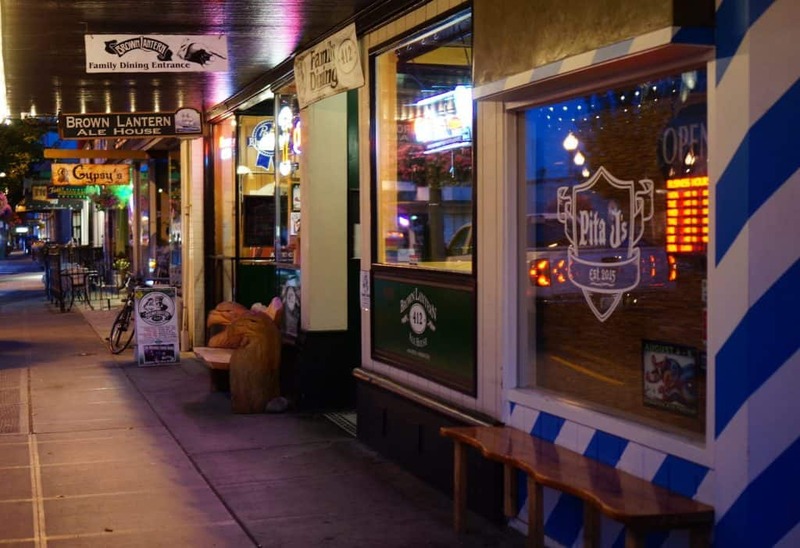 The Brown Lantern Ale House is an Anacortes institution, dating back to 1933. It’s a bit rough and tumble with that much history, and still draws a lot of locals. Luckily, everyone is friendly and it’s easy to fit in at this sports bar-slash-brew pub. I’ve eaten here a few times and everything is good. The menu is primarily hearty American bar food. If you want to go out for just drinks, there are some nice options. From wine bars to cocktail bars to breweries, you can find any libations you like. Anacortes has several hotels and vacation rentals/Airbnbs to choose from. If you’re visiting Anacortes for 3 days, I recommend booking a hotel near the center of town. That way you can walk around and explore the downtown core. On my first trip, I was hosted at the Majestic Inn & Spa. The Majestic is a bit like the crown jewel for hotels in Anacortes. It’s a beautiful, modern property with a lot of history, located along the main street downtown. There’s the original building, a new building with additional rooms, meeting space, a garden (perfect wedding venue! ), and a rooftop bar. 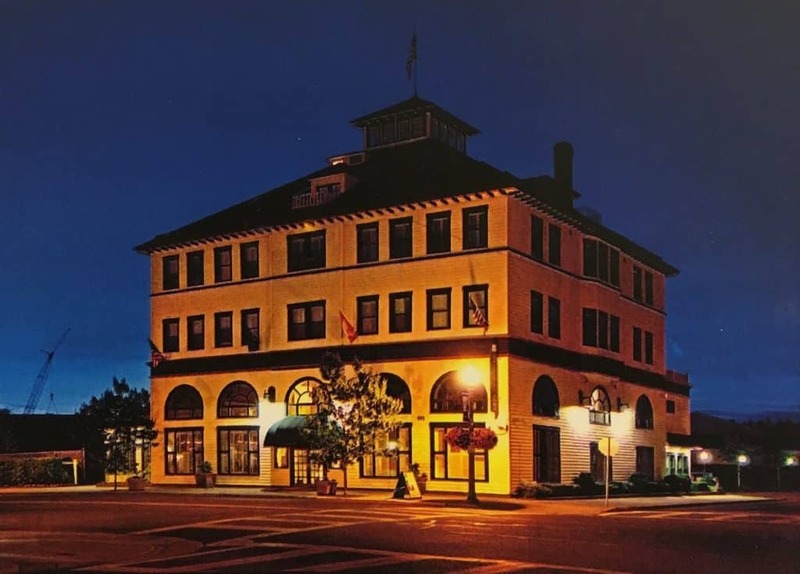 The Majestic Inn & Spa is also a historic building in downtown Anacortes (the McNaught Building), so even if you don’t stay there you can pass by and admire the building as part of the walking history tour I recommended. On my second trip to Anacortes, I was hosted at the Cap Sante Inn. The Cap Sante Inn is a few blocks from the main core of Anacortes. It harkens back to roadside motels with low-slung two-story buildings. 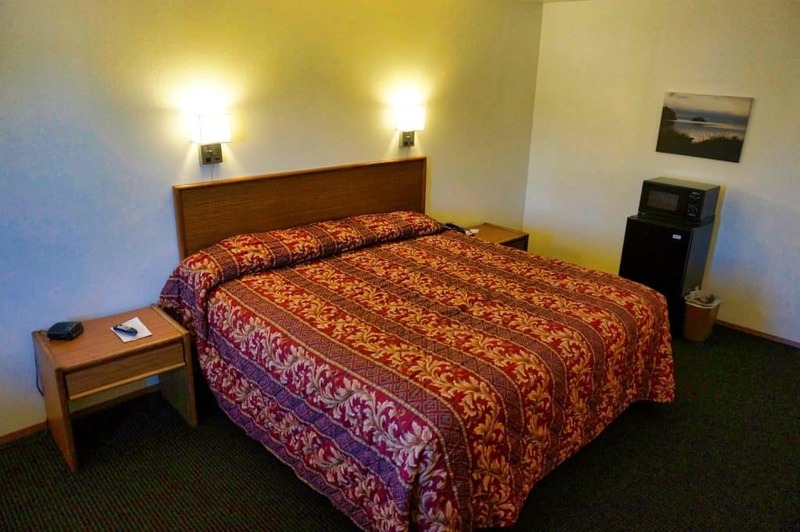 The Cap Sante Inn is a good option for a budget hotel in Anacortes. Search hotels in Anacortes on HotelsCombined to find the best price. There are plenty more too if none of these strike your fancy or budget. If you’ve never booked on Airbnb before, click here to get $40 off your first booking. You’re all set to plan your trip to Anacortes! If you have questions, let me know in the comments. Thank you for sharing such an informative article and great photos! I’ll have to plan a visit to Anacortes soon! I live in Bellingham and drove through Anacortes recently on my way to my dentist’s Oak Harbor office. I also went to San Juan Island in November and have another trip planned in January for my 35th birthday. We just moved to Bellingham a few months ago, so it’s nice to hear about local places to visit! Marina, glad this post was helpful! 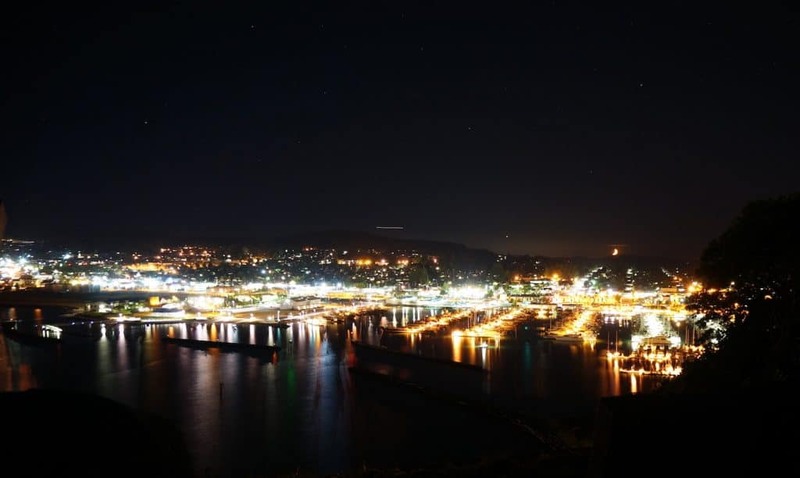 Anacortes is really great, I hope you can make a trip there soon!